You have submitted an impressive resume and MBA admissions essay to your dream business school, and now you have received an invitation for an interview. You feel excited and one step closer to your dream school. 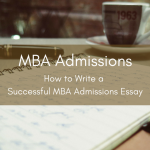 But bear in mind that you still have that final step of the MBA interview, and this can be a challenging experience, especially for candidates who are not well prepared. The MBA admissions interview is your best opportunity to promote yourself to interviewers, and it gives admissions officers a chance to get to know more about you. Therefore, the MBA interview is very important and needs to be taken seriously. After all, it is your only opportunity to impress admissions officers at the business school directly. But what are the most important tips for preparing for an MBA interview? In this article, we present some critical points of preparation and provide some advice for researching and collecting information that will be necessary for before undergoing an MBA interview. Joining forums or meeting MBA graduates and MBA students from the university to which you are applying can help give you some direction about how to prepare. For MBA forums, check out websites such as FindMBA or GMATClub to collect useful information. You can also ask MBA graduates in these forums about their experiences and get some advice about what worked for them. Different MBA programs are looking for candidates from different experiences and with differing capabilities and qualities. In addition, MBA graduates from different business school also tend to have different professional goals and career paths. Therefore, before the MBA interview, it is important to do some research about where MBA graduates of your program go after graduation so that you can show your enthusiasm and passion for working in your relevant industry during the interview. According to the American Marketing Association, the most popular positions for MBA graduates have been management consultant, finance/marketing manager, investment banker, operations manager, financial advisor, and related career paths. However, the trend of MBA employment has been changing in recent years. Whereas, according to Poets&Quants and employment reports published by each business school, the majority of MBA graduates from schools such as Wharton, Columbia, Booth, and NYU Stern still find careers in consulting groups or the financial service industry, for MBA graduates from UCLA, Berkeley, Stanford, Northwestern, and the University of Washington, career trends have shifted in recent years towards positions in leading tech firms such as Google, Microsoft, and Amazon. With these trends in mind, before the MBA interview, it is very important to figure out what kind of talent and direction your MBA program tends to prefer. By doing this, you will be able to impress interviewers by showing them that you are equipped with the capabilities and characteristics that they are looking for. However, it is equally important to be honest about your career goals and not mislead admissions officers about the path you intend to take. Admissions officers assume that interviewees will have a thorough knowledge about the program they are applying to, and the best way to learn about your school and program is to visit the admissions website well in advance and learn as much as you can about the school and what it values. Different schools have different concentrations on their MBA program. Some focus on Strategy and Management, while others emphasize Marketing, Finance, Operation, or other areas. Make sure you know the concentration of your program and think about what you want to learn from the courses they provide. Make a list of specific courses and professors that especially interest you. 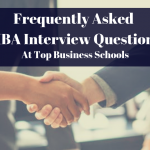 By doing this, you can show interviewers your readiness for the MBA program and how you will utilize the curriculum to achieve your specific goals. It’s important to know about notable MBA alumni from your school and prepare answers to some questions: Where do they work? What are their accomplishments and management styles? How did these figures inspire and motivate you to apply to this school? 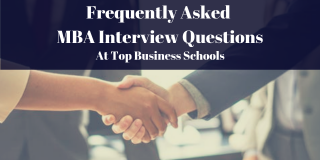 During the interview, you might be asked questions such as “Why this MBA program instead of MBA programs of other schools?” Preparing information about accomplished alumni is a good way to present your motivations and ambitions for the MBA program and interest in the MBA alumni network. Since strong communication and networking are among the most sought-after skills for MBA candidates, a good way to demonstrate your stellar networking skills is to attend an event held by your school. Check out the event calendar and search for events you can attend in order to network with MBA students, faculty, and alumni of the school. By actively engaging in MBA networking events, you can not only get useful information for interviews but also present your ambitions and proactive measures to interviewers. 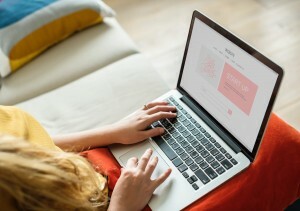 An increasing number of MBA programs are making use of telephone, Skype, and other programs as remote interview mediums. However, these formats can create extra stress for candidates who are not prepared for the specific challenges created by non-face-to-face interaction. Here are some helpful tips to increase your confidence and get the most out of your remote MBA interview. Phone interviews can present unique challenges for candidates, as nervousness about answering questions gets mixed with misunderstandings that can occur without the use of bodily gestures and facial cues. Therefore, a phone interview should be avoided if possible, especially for non-native English speakers. If your interviewer requests using such a format, politely explain that this may present difficulties for you, and that you would be more able to more fully present yourself via a video interview. *At the beginning of your interview, politely ask the interviewer to “please speak clearly and slowly” so that you can catch every part of the question the first time. *If you have difficulties with fluency or pronunciation in speaking English, answer slowly and deliberately, and let the interviewer know that if they do not understand something, they may ask you to repeat it at any time. *Always use a voice that is both polite but full of confidence. Interviewers understand that ESL students might have difficulties communication, but that there are other qualities that can still shine through via your tone and the content of your answers. Although you may be doing the video interview in your own home, it is important to keep the interview formal and professional. Dress formally to help you concentrate on the interview and maintain a professional mindset. Do your interview in an empty room and eliminate any noises or visuals that might disturb the interview or distract you and the interviewers. Make sure your camera is on the right position and check if lighting and visuals are properly set. Good eye contact shows confidence. When you don’t focus on the person in front of you, you appear uncomfortable with the interview and/or unsure about what you are saying. Therefore, both when being asked a question and when answering, it is important to make appropriate eye contact just as you would in a face-to-face interview to demonstrate that you come across as confident and full present in the interview. Although your interviewer may be sitting five thousand miles away, he or she can still easily see when you are looking at notes. Using notes not only distracts the interviewer’s attention and limits eye contact, but it also might indicate that you are not as confident and well-prepared for the interview as you should be. For schools like Harvard and MIT, MBA admissions interviews are conducted by members of the admissions’ officers. Meanwhile, some top business schools like Stanford, Columbia and Northwestern deploy alumni to conduct admissions interviews. Other schools, including UCLA, Chicago, and Yale, train their second-year student to conduct the interviews. Therefore, knowing in advance who your interviewer will be can help you prepare a more personalized interview experience. Conduct some research on your interviewer beforehand. Do a Google search or check out their profiles on LinkedIn. During the interview, bringing up something in common between you and the interviewer can be a good way to break the ice and make a winning first impression. It is mostly the case that alum interviewers are volunteering their time and energy to interview candidates. Therefore, don’t forget to show your appreciation for their time and effort to meet you. At the end of your interview, briefly extend thanks to the interviewer for their time and attention and show confidence that you will be corresponding with them in the future. It is important to send a thank-you email to your interviewer within 24 hours after the interview. By doing this, you can not only show your appreciation but also leave a deeper impression on the interviewer. A thank-you email should be simple. In the letter, tell them why you enjoyed meeting with them and remind them why you really hope to be accepted into this MBA program.